OKLAHOMA CITY, Okla. (BRAIN) — The North American Bikeshare Association is claiming another victory as an Oklahoma bill that would have pre-empted local control of dockless bikeshare did not make it to the House floor last week. SANTA MONICA, Calif. (BRAIN) — A potential buyer may breathe new life into popular bike rental platform Spinlister, which announced last month that it would shut down. The tech company has received multiple offers from companies interested in acquiring its assets, according to CEO Marcelo Loureiro. NEW YORK (BRAIN) — The Dutch e-bike brand VanMoof is launching a subscription program for its bikes, starting at $19 per month. NEW YORK (BRAIN) — Mayor Bill de Blasio on Tuesday announced that the city will allow use of pedal-assist e-bikes, but will continue to ban throttled e-bikes. The state of New York does not regulate e-bikes, which remain technically illegal to use in the state, although legislation is pending in Albany. WESTBROOK, Maine (BRAIN) — The North America Bikeshare Association and the Better Bike Share Partnership are working together to produce a bikeshare conference, to be held Sept. 4-7 in Portland, Oregon. UPDATED: Ofo says it voluntarily withdrew from NABSA. TALLAHASSEE, Fla. (BRAIN) — The North American Bikeshare Association has expelled Ofo US Limited from its membership. The company is the U.S. operation of China's Ofo, one of the world's largest dockless bike share companies. 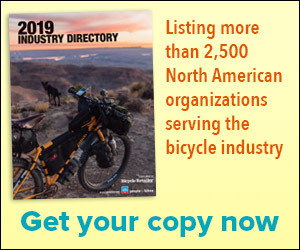 SANTA MONICA, Calif. (BRAIN) — Bikeshare provider CycleHop recently launched an upgraded platform designed to connect users, system operators, sponsors and suppliers, and to help inform potential bikeshare customers on the latest trends and developments in the industry.